These are just a few of the thought-provoking questions addressed in this beautifully illustrated book. 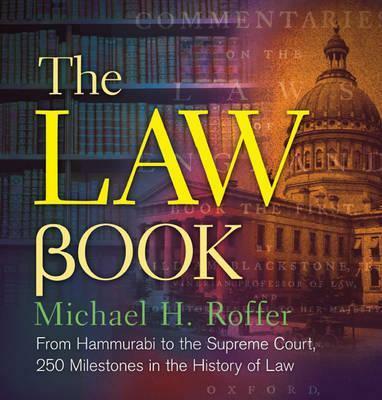 Join author Michael H. Roffer as he explores 250 of the most fundamental, far-reaching, and often-controversial cases, laws, and trials that have profoundly changed our world—for good or bad. Offering authoritative context to ancient documents as well as today’s hot-button issues, The Law Book presents a comprehensive look at the rules by which we live our lives. It covers such diverse topics as the Code of Hammurabi, the Ten Commandments, the Trial of Socrates, the Bill of Rights, women’s suffrage, the insanity defense, and more. Roffer takes us around the globe to ancient Rome and medieval England before transporting us forward to contemporary accounts that tackle everything from civil rights, surrogacy, and assisted suicide to the 2000 U.S. presidential election, Google Books, and the fight for marriage equality. Organized chronologically, the entries each consist of a short essay and a stunning full-color image, while the “Notes and Further Reading” section provides resources for more in-depth study. Justice may be blind, but this collection brings the rich history of the law to light.